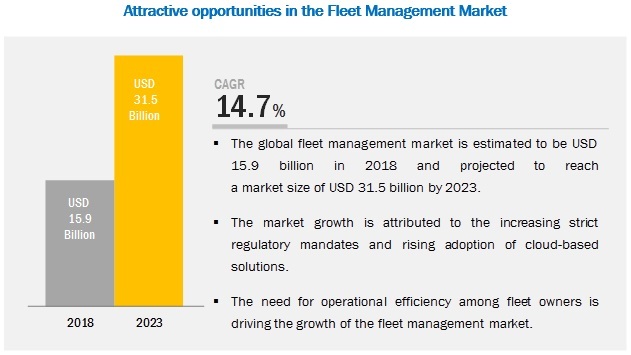 [154 Pages Report] The global fleet management market size is expected to grow from USD 15.9 billion in 2018 to USD 31.5 billion by 2023, at a Compound Annual Growth Rate (CAGR) of 14.7% during the forecast period. The growth of the market can be attributed to the cost benefits versus Software-as-a-Service (SaaS) and cloud-based deployments of fleet management solutions. The primary factors driving the growth of market include the increasing government regulations and need for optimization of fleet operating expenses. The other factors supporting the market growth include the decreasing hardware and software costs and growing need for operational efficiency among fleet owners. By deployment type, the fleet management market is segmented into on-premises and cloud. The cloud segment is expected to grow at a higher CAGR during the forecast period, due to its cost-efficiency and hassle-free integration. Among fleet types, the passenger cars segment is expected to lead the market in terms of market size during the forecast period. Among services, the professional services segment is expected to have a larger share in the fleet management market. Strict regulatory mandates are the primary drivers for the adoption of professional services across North America and Europe, resulting in the increased requirement for consulting, deployment, and integration services. The managed services segment is expected to witness a higher CAGR during the forecast period, due to the increasing focus on primary operations by major companies. North America to account for the largest market size during the forecast period. The global fleet management market by region covers 5 major geographic regions, namely, North America, Asia Pacific (APAC), Europe, Latin America, and Middle East and Africa (MEA). North America is expected to grow at a CAGR of 12.0% during the forecast period, due to the early adoption of fleet management solutions and strict government mandates. With the ongoing ELD mandate, this region is expected to dominate the market due to the large presence of commercial fleets. The key and emerging market players in the market include ARI Fleet Management (US), Azuga (US), Chevin Fleet Solutions (Australia), Ctrack (US), Donlen Corporation (US), Geotab (Canada), GPS Insight (US), Masternaut (UK), MiX Telematics (South Africa) , Nextraq (US), Teletrac Navman (US), Trimble (US), Verizon Connect (US), Wheels, Inc (US), and Fleetroot (UAE). These players have adopted various strategies to grow in the global fleet management market. Geotab is a leading player in the market. The company was the first to provide fleet telematics solutions. It is an established provider of the global positioning system and vehicle tracking offerings. The country is a leader in providing open platform fleet management solutions to businesses of all size. In February 2019, Omnitracs launched Active Mobile Gateway with Communications (AMG-C), an advanced BYOD solution that offers device pairing, flexible connection options, such as WiFi, 4G, LTE, Bluetooth, and simple management. This new launch would help drivers have more flexible solutions using the LTE connectivity while working from anywhere. In October 2018, Masternaut launched its new product PULSE, a telematics product that is a plug and play solution focused on offering cost-effective and hassle-free telematics solutions to its users. In July 2018, Verizon Connect launched a connectivity app, Work Mobile, which helps field workers stay connected with their back offices, receive job details, and share fieldwork insights and information with their companies’ back offices, thus helping them improve productivity and increase work visibility. In March 2018, Donlen Corporation launched a new order management system available with its fleet management platform, FleetView, which is based on streamlining the order process from placing an order for the vehicle to the safe vehicle delivery to the driver. In March 2018, Geotab launched Garmin ELD Bundle as a part of its Geotab cloud ELD for tracking, managing, and sharing Records Of Duty Status (RODS) having features, such as HOS reporting and driver safety improvement. Where will all these developments take the industry in the long term? What are the upcoming trends for the fleet management market? Which segment provides growth opportunities? Who are the leading vendors operating in this market? What are the opportunities for new market entrants? *Details on Business Overview, Solutions, Products & Services, Key Insights, Recent Developments, SWOT Analysis, MnM View Might Not Be Captured in Case of Unlisted Companies. The study involved 4 major activities to estimate the current market size of the fleet management market. The exhaustive secondary research was done to collect information on the market, peer market, and parent market. The next step was to validate these findings, assumptions, and sizing with the industry experts across value chain through primary research. Both top-down and bottom-up approaches were employed to estimate the overall market size. Thereafter, the market breakup and data triangulation procedures were used to estimate the market size of the segments and subsegments of the fleet management market. In the secondary research process, various secondary sources, such as D&B Hoovers, Bloomberg BusinessWeek, and Factiva, have been referred to identify and collect information for this study. These secondary sources included annual reports; press releases and investor presentations of companies; whitepapers, certified publications, and articles by recognized authors; gold standard and silver standard websites; fleet management technology Research and Development (R&D) organizations; regulatory bodies; and databases. To define, describe, and forecast the global fleet management market by component (solutions [software and appliances] and services), deployment type (on-premises and cloud), service (professional services and managed services), and region. 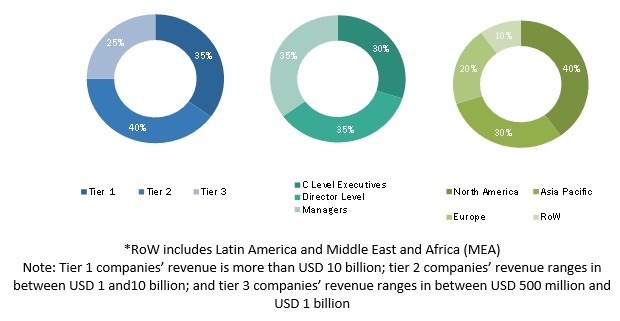 To forecast the revenue of the market’s segments with respect to 4 major regions, namely, North America, Europe, Asia Pacific (APAC), Latin America, and Middle East and Africa (MEA). Component (solutions [software and appliances] and services), Deployment Type (on-premises and cloud), Services (professional services and managed services), and Region. ARI Fleet Management (US), Azuga (US), Chevin Fleet Solutions (Australia), Ctrack (US), Donlen Corporation (US), Geotab (Canada), GPS Insight (US), Masternaut (UK), MiX Telematics (South Africa) , Nextraq (US), Teletrac Navman (US), Trimble (US), Verizon Connect (US), Wheels, Inc (US), and Fleetroot (UAE).